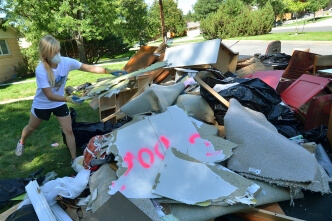 University of Colorado student volunteer assists in the cleanup after the September 2013 floods. Photo courtesy of Casey A. Cass/University of Colorado. Colorado has seen many disasters over the years. From devastating wildfires, to the Aurora shooting,and the historic floods that left incredible destruction across 17 counties in September 2013. Starting in Spring 2013, we – together with the Colorado Association of Funders – have been leading a task force comprised of many of Colorado’s largest private and community foundations to evaluate how to most effectively play a role in disaster recovery. “We’ve learned a lot from experiences following the Aurora shooting, wildfires and other disasters, as well as from the Center for Disaster Philanthropy,” shares Sheila Bugdanowitz, Rose Community Foundation president and CEO and task force chair. Lessons learned from the Aurora shooting offer an example. “All the money raised went into a victims fund,” explains Joanne Kelley, executive director for the Colorado Association of Funders. “After it was distributed to the victims, there was a need for mental health healing centers for the community, but there was no money left. Foundations feel they can play a critical role in disaster recovery by funding longer-term community needs that the general public isn’t as willing to support,” she adds. The task force is also focused on a collective approach. “To have the biggest impact, foundations feel they have to do this together,” says Kelley. Within just a few months of starting these discussions, Colorado was hit by flooding, offering an opportunity to pilot the concept. The Colorado Association of Funders established a longer-term Colorado Funders Flood Recovery Fund for its member foundations interested in collectively responding to issues that emerge across the affected region. Rose Community Foundation is the fiscal sponsor and a contributor. In addition to playing an important role in the long-term recovery from the floods, the foundations involved also hope to learn from this process. “We hope to have good community conversation about what’s really needed, and to learn how the foundation community can best respond following disasters,” says Kelley. In addition to responding to long-term needs through the Colorado Funders Flood Recovery Fund, Rose Community Foundation has also committed to matching flood relief donations made by Foundation trustees, committee members and staff.